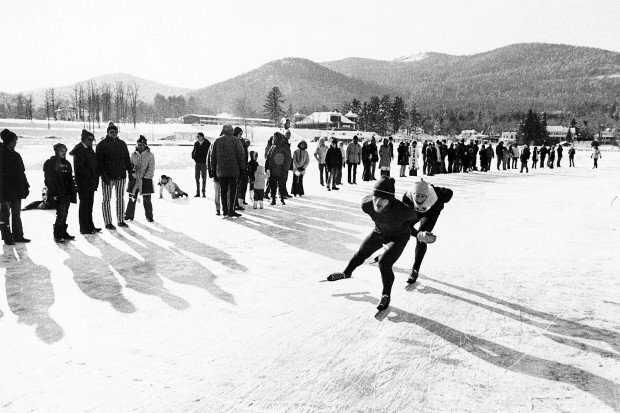 Speed skaters race on the ice in this undated photo of Lake George Winter Carnival, believed to be taken in the 1970s. The annual event celebrates its 50th anniversary this year. 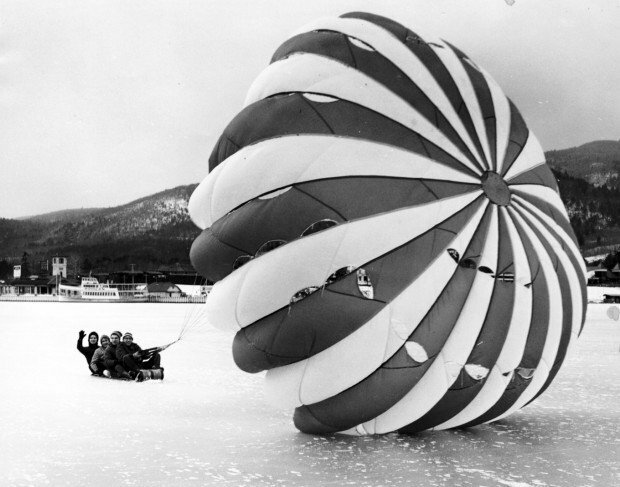 Cars race – and crash – on the ice in this undated photo of Lake George Winter Carnival, believed to be taken in the 1970s. The annual event celebrates its 50th anniversary this year. LAKE GEORGE -- In the 50 years since Lake George Winter Carnival was started, organizers have traded speed skating and horse racing for motorcycles and four-wheelers. What hasn’t changed, however, is the carnival’s boost to local businesses during the offseason. Each February weekend since 1961 has seen events like the annual motorcycle races drive thousands of people into Lake George, pumping cash into the seasonal tourism economy. Doug Frost, owner of Lake George’s Tom-Tom Shop, has had a front-row seat to the annual celebration of ice and snow since the beginning. "We’re a summer resort, and you can’t expect a lot of businesses to remain open during the winter," Frost said. "The carnival is a great boost and it means more business open for the month of February. The more businesses open, the better." Between Memorial Day and Labor Day, throngs of tourists are welcomed by the smells, sounds and neon lights of a hopping destination community. But for years, winter has been known as cannonball season in Lake George — a tongue-in-cheek reference to the ability to fire a cannon down the often deserted main drag without injuring or maiming a soul. "Twice as many businesses stay open during the winter now than they did 10 years ago," said Lake George Village Mayor Robert Blais. "Many of those that do remain open during the winter run a deficit. Just when they start asking themselves, ‘What am I doing?’, carnival comes and they experience a nice boost." For Judd’s Tavern, the carnival provides a much-needed boost during an otherwise slow time of year. "It’s huge for us," said Judd’s Tavern Manager Mark French. "The carnival gives us an additional month of legitimate business." While some businesses like Judd’s remain open all winter, many others like the Shoreline Restaurant and DJ’s Nightclub will open just for the month of February. The roots of the carnival date back nearly a century. The first organized Lake George harness race was in 1915 and ski races became regular events by the 1940s. But it wasn’t until the Lake George Chamber of Commerce decided in 1961 to organize the hodge-podge of activities into a single-week festival that the winter carnival took shape. Over the years, the length has steadily increased until reaching the current four-week format. In 1973, the popular polar plunge became part of the carnival; the outhouse races were added in 1983. It was around that time that the carnival experienced difficulties. In 1982, there weren’t any local volunteers to take on the task of organizing the event. The Saratoga Jaycees ran the festival, marking the only time in the carnival’s history it wasn’t an entirely locally driven show. Still a volunteer-run event, the carnival today is largely funded by the town and village of Lake George and Warren County. While lobbying for continued county funding late last month, carnival committee Chairman Ed Kokalas told Warren County Supervisors that the number of room nights sold at hotels in and around Lake George increases four-fold because of event. The carnival received $5,000 of the $295,000 in occupancy tax revenues dolled out by the county. In contrast, the Americade summer motorcycle rally got $48,000 in county occupancy tax support. If winter carnival is what keeps Lake George businesses afloat in the off season, Americade is widely considered by officials as the event that fills municipal sales-tax coffers. And though private donations of food and goods have been sluggish relative to recent years, event organizers say there have been more people looking for low-cost activities within driving distance due to the economy. "I see it as an event that’s close by and doesn’t cost a lot of money," said winter carnival committee co-treasurer Kathi Kokalas. This year, mainstay events — including the chili cook-off the first Saturday, tavern competition the second Sunday, and car races the third weekend — will return. But organizers have also added a few extras for the carnival’s golden anniversary. In past years, evening fireworks were reserved to a single weekend. This year, each Saturday night will feature the color-laced pyrotechnics. "The increased number of fireworks we need are obviously more costly," Kokalas said. "But we’re doing our best to figure it out." Events are scheduled for every Saturday and Sunday throughout February. A full schedule of carnival events can be viewed at www.lakegeorgewintercarnival.com/schedule. I have an idea for the winter carnival - FRUITCAKE CHUNKIN (same as "pumpkin chunkin" except use stale, left-over holiday fruitcakes)! Visit www.punkinchunkin.com to see how its done. Imagine dozens of fruitcakes flying out over Lake George, fired out of air cannons, giant sling-shots, catapults and the like! They can even have night time events with "flaming fruitcakes" (fruitcakes doused with kerosene, gas, etc, lit up then shot out over the lake by a super-sized slingshot) – do this just before the fireworks go off! Na event like this could put the winter carnival on the map, maybe even on tv like the pumpkin chunkin championship.